this day in crime history: august 7, 1970 | Nobody Move! On this date in 1970, four men took hostages in the Marin County, CA courthouse in an attempt to free three prison inmates. The incident began when Jonathan Jackson carried a bag containing several guns into court during the trial of San Quentin inmate James McClain. He used the guns to free McClain, as well San Quentin inmates Ruchell McGee and James Christmas, who were there to testify at the trial. The men took Judge Harold Haley, Deputy District Attorney Gary Thomas and jurors Maria Elena Graham, Doris Whitmer, and Joyce Rodoni hostage. They walked the hostages out of the building and to a rented van. On the way out of the building, they informed the police of their demand: Release the “Soledad Brothers” by 12:30 PM that day. The Soledad Brothers were three inmates who were charged with murdering a prison guard at Soleded Prison in January 1970. The guard was killed in retaliation for the the fatal shooting of four black inmates by a prison guard at Soledad. One of the men, George Jackson, was the brother of Jonathan Jackson. While moving between the courthouse and the van, there was a brief exchange of gunfire. The gunmen then loaded the hostages into the van and drove off. As the van headed to the 101 freeway, it was stopped by a police roadblock. After the van stopped, police and the gunmen engaged in a shootout. In the ensuing battle, hostage-takers McClain, Christmas, and Jackson were killed. McGee was seriously injured. Judge Haley was killed by the shotgun the hostage-takers had secured to his neck. Deputy DA Thomas was paralyzed by a shot to his back, and juror Graham was wounded in her arm. 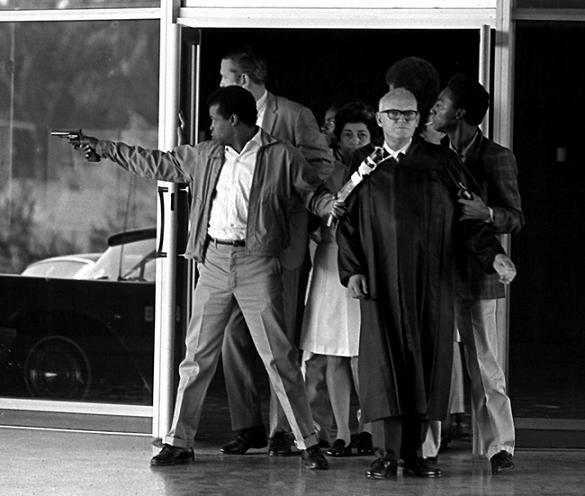 Radical activist Angela Davis was eventually arrested and charged with conspiracy, as the guns used by the hostage takers were registered to her. She was acquitted of the charges. George Jackson was killed the following year while leading a prison riot at San Quentin Prison. Guess the world is your oyster when you’re a communist-loving anti-American agitator with ties to the SDS. I will celebrate her passing, which cannot come soon enough.